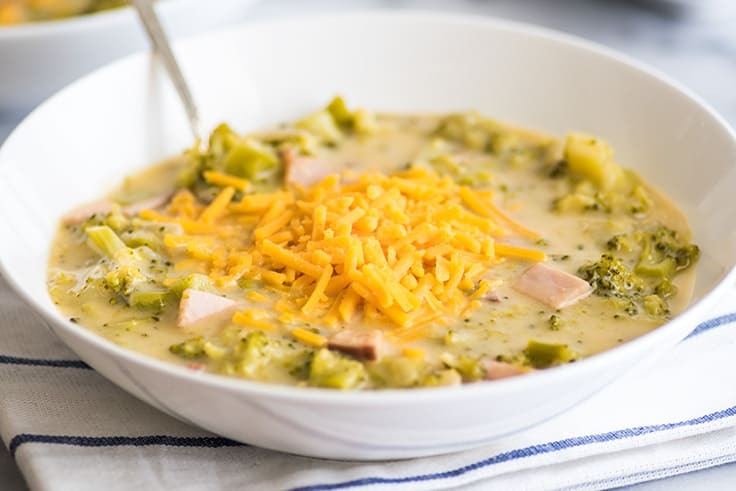 Easy Broccoli Chowder made with sharp and delicious cheddar cheese and ham. A perfect and easy weeknight dinner for those nights when cheese is a necessity. We are in week three of our February soup series. So far, we’ve had the World’s Easiest Chicken Taco Soup and Easy and Comforting Ham and Potato Soup. This week, we’re moving onto something a little heavier and A LOT cheesier, Easy Cheesy Broccoli Chowder. Proving that good recipes come from all over the place, the original version of this one came out of a recycling bin. A couple of years ago, I used up the last stick of butter in a Danish Creamery Butter box, broke the box down, and threw it in my kitchen recycling bin. Just as I was walking away, the recipe printed on the inside caught my eye. I fished it out, gave it a shot, and I’ve never looked back. 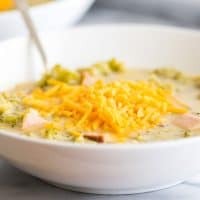 Of all the soup recipes floating around the interwebs, aside from your classic chicken noodle, broccoli chowder is the one I see with the most variations. I think that’s because everyone likes something a little different from their broccoli chowder. Are you there for the slightly sweet, earthy broccoli? Is it all about the salty ham? Do you like the rich creaminess of the broth with just a hint of cheddar? 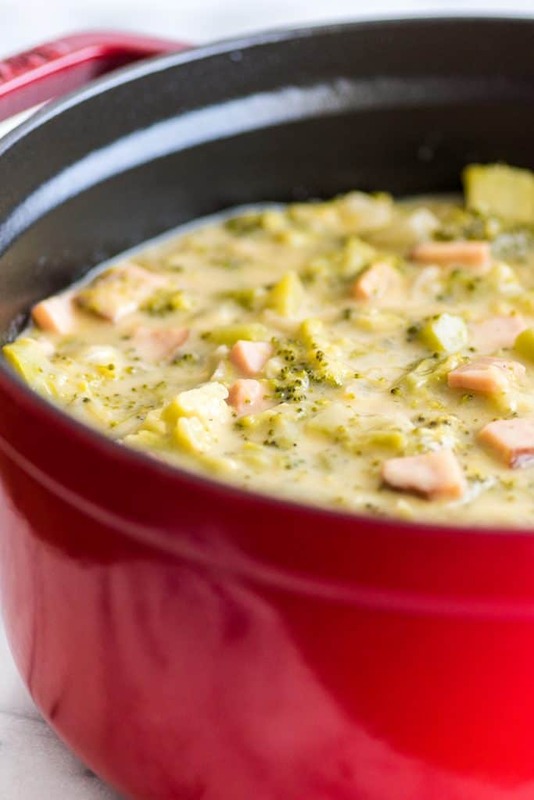 This particular broccoli chowder is all about the cheese. And not just any cheese. This is sharp, tangy cheddar in a broth so thick, you could practically stand a spoon up in it. If you don’t like sharp cheese, that’s okay, there are a million other broccoli chowders out there for you. If you do, oh, my friend, you are in for a treat. This soup is fast and easy, and you can do all the prep work a couple of days in advance. It’s absolutely gorgeous when it’s done and is so rich and delicious, you’ll feel like it should be eaten curled up by a roaring fire under a giant fluffy throw. Looking for more easy weeknight meals? Try my Tri-tip in the Oven, Mac and Cheese for Two, and Chicken in Cream Sauce. In a medium pot, combine broccoli and chicken broth. Cover and simmer until tender, about 10 minutes. Drain the chicken broth into a separate container to use later and set broccoli and broth aside. In a large pot, over medium heat, melt butter and add onions, cooking until translucent. Add flour and cook, whisking continuously for about 2 minutes, until the flour is just golden. Continue to stir and slowly pour in chicken broth and milk. Simmer, stirring occasionally, for about 5 minutes, until the broth has thickened. Stir in cheese, ham, broccoli, pepper, and salt generously to taste. Heat until cheese is melted and soup is warmed through. Approximate nutritional information is for five servings. Low-yield Instructions: This recipe halves cleanly. Make-ahead Instructions: Broccoli, ham, onions, and cheese can be cut up to two days in advance and stored in an airtight container. Make sure your broccoli is dry when you store it. Freezer Instructions: This soup will keep in the freezer for up to four months in an air-tight container. It must be defrosted in the refrigerator. If you try to defrost it in the microwave, the broccoli will turn to mush. Tell me, what’s the weirdest place you’ve ever gotten a recipe from? Such comfort food. Looks delicious. I love broccoli and cheddar together – bonus with ham! This chowder looks absolutely delicious! I must say my chowder ways have only extended to seafood so far. This ham and broccoli one sure does sound wonderful. I never knew broccoli chowder was so popular. And your defrosting intructions are spot on. I have had too many mushy episodes to fill pages with. Thanks, Shreyashi! I was kind of surprised by it’s popularity too. It wasn’t a soup that was really on my radar until a few years ago when I joined Pinterest and saw it everywhere. At that point, I was like, I guess this is a soup I should be looking into and once I tried it, I totally understood why it was so popular. That’s a great idea. If you try it, let me know how it works out for you! Yum. Your soup has everything you need for a great meal. This recipe is a perfect was to use up that Easter ham. Will hang on this dish. 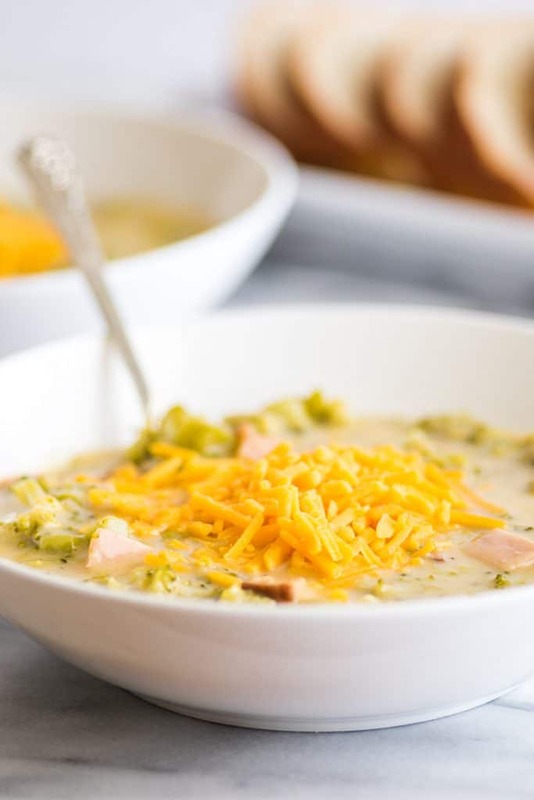 I think every recipe should be “all about the cheese.” 🙂 But seriously, this soup looks amazing! Such delicious flavors going on here! Great recipe! And I really love those spoons! OK, the weirdest place I have ever gotten a recipe is this tiny random cookbook (I have no idea how it came into my possession) that is from an association for the blind? I think. I honestly can’t remember and I don’t even know if I have it anymore. But, it was for pesto and I have adapted it into my own recipe that I have used to years. So totally random and weird. BUT, this soup is so totally NOT weird. That sharp cheddar! I am in love with sharp cheddar, and this creamy soup looks dreamy! A broccoli chowder all about the cheese? I’m in! I love the idea of freezing to just pop out at a later time to enjoy. Looks great! Made this for dinner tonight. Used home-made ham stock in place of chicken broth and it was fantastic!!! My first attempt at a chowder and i already feel like a pro!!! So glad you enjoyed it, Shawna! And making it with homemade ham stock sounds AMAZING!! Just found this recipe a couple of weeks ago when I had some broccoli look pathetic in the crisper and just didn’t want to make steamed broccoli. OMG!!! I’m not a good soup maker, but this was smack you in the mouth good. This week I bought broccoli to make this recipe. Thank you so much. Thanks, Teresa! So glad you enjoyed it! !